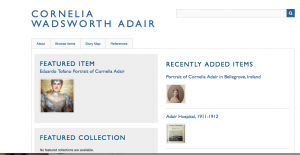 My project aims to create a digital biography/storymap of Cornelia Wadsworth Ritchie Adair (1837-1921), a pioneer originally from Geneseo, New York who played a substantial role in land development in Donegal, Ireland, and Southwest Texas. After her marriage to notorious Irish landowner John George Adair, Cornelia managed their estate at Glenveagh and was the primary manager of the JA Ranch in Texas, which at its height consisted of 500,000 acres primarily used for cattle grazing. Following the 1916 Easter Rising, Cornelia fled Glenveagh and devoted her time to land expansion in Texas. 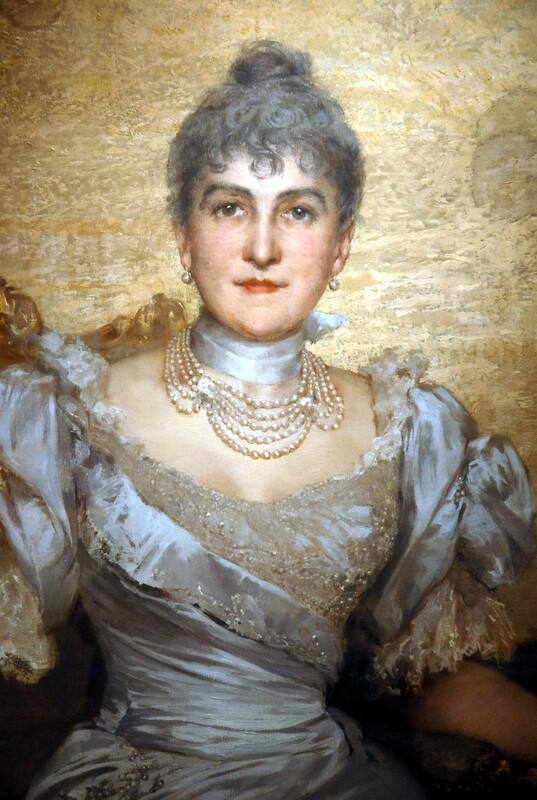 Considerable primary and secondary source material exists on Cornelia Adair because her life intersected with many developing narratives of the late 19th century–including Irish land wars, the Easter Rising, Native American land relations, early environmentalist practices and Republican philanthropy. However, I wanted to organize and compile these sources into one website that focuses a narrative on Cornelia Adair, with a particular focus on the way Adair transformed spaces with an eye towards community development. As such, I decided to organize available primary documents and existing research on the Adairs into a biographical story map, which provides a spatial lens for assessing Cornelia Adair’s extensive travels and proto-environmentalist land practices. Before beginning the digital map, though, I had to develop a homepage and subsequent pages that would contextualize Adair and provide users with a fuller description of her biographical legacy. I used Omeka, an open-source digital archivist platform, to create “items” related to Adair, most of which contained a picture, source/publishing rights information, and several sentences of description to explain how that particular item connects to Adair’s larger narrative story. I also added three simple pages to the navigator of my site: a biography page, in which I provided a short (~750 word) biography of Adair; a bibliography to aggregate my sources and provide users with further reading material; and an “about the project page.” In this last page, I state the goals of my website, its origins in my research grant from the Geneseo Foundation, the digital platforms I used to make the site, and an acknowledgement to the folks who helped me in my research (including Dr. Schacht, Dr. Anne, Warren Stricker, and Sean O’Gaoithin). 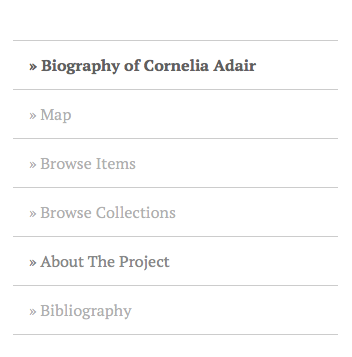 I also organized my items into collections, so users can quickly browse collections such as “pictures of Cornelia Adair” or “letters from Cornelia Adair” without combing through the map. Finally, after adding the appropriate biographical and contextual information onto the site, I began developing my original aim for the project: a digital storymap. I used the Omeka plugin Geolocation to locate each of my items to a specific point on a map. From there, I was able to create a more holistic, spatial representation of the scope of Cornelia Adair’s travel and activities. 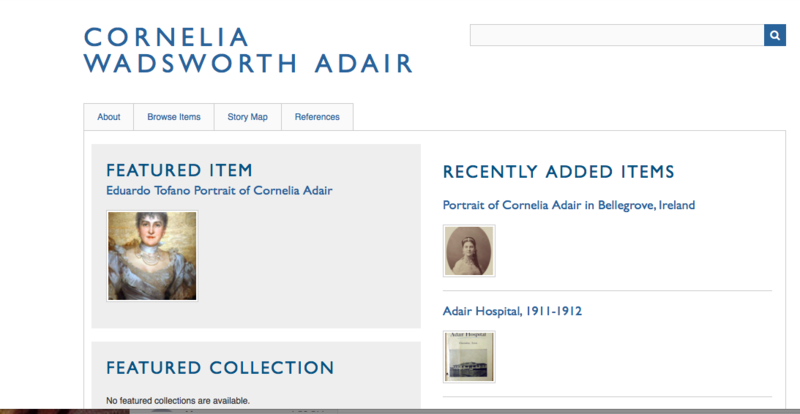 Users can browse the map to find items, or zoom in to read about the legacy of Cornelia Adair at a particular place. 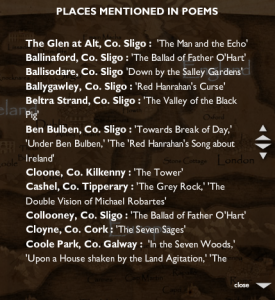 This is just one example of many forms of storymaps (I wrote about an earlier one that examines Yeats’s legacy created by the National Library of Ireland), but in general, I feel that my project helps build onto Cornelia Adair’s biography by showing how her activity connects to particular spaces. For visual and spatial learners, maps are often a critical way to transmit stories, which is what I sought out to accomplish in this project. However, the “about” section and “browse items/collections” feature of my website allows users who learn textually to explore the same content outside the confines of a map. There are still many directions for me to expand upon my website on Cornelia Adair. For one thing, I’d like to incorporate photographs I’ve seen of Ireland’s land surveys of Glenveagh castle from before and after Cornelia’s time there, because these maps illuminate how Cornelia built and transformed a physical place, one that now operates as a national park in Donegal. I also want to add an audio recording of an interview I conducted with Sean O’Gaoithin, the head gardener of Glenveagh National Park (Sean has researched Cornelia’s influence extensively). For now, though, I’m happy with the outcome of my project, and satisfied with the ways Omeka and Geolocation enabled me to visually tell a story that compiles a wide range of resources from various locations. The tool (or really, set of tools) is an excellent platform to expand upon the traditional practice of archiving and categorizing historical information to convey broader narratives. 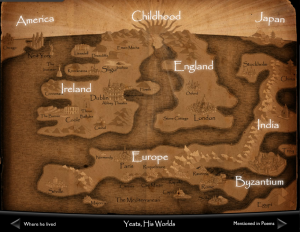 The storymap “Yeats, His World” from the National Library of Ireland is a prime example of how interactive mapping can imbue our understanding of an author’s connection to place. The map, which is part of a larger digital (and physical) exhibition on Yeats, organizes photos and biographical information on Yeats by country (and then, region) so users can explore the poet’s involvement with different areas of the world. This form of spatial learning is particularly important for an author like Yeats, whose poetry often centers on specific places in rural and urban Ireland. 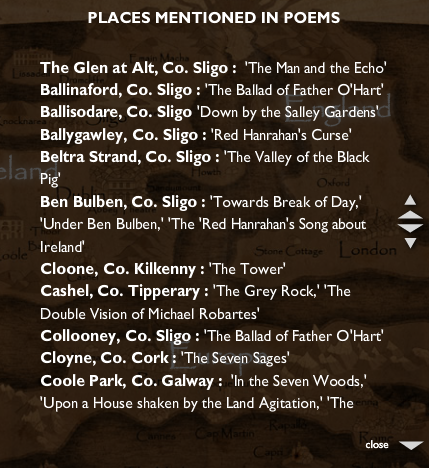 The map provides an image, for instance, of Yeats’ tower at Thoor Ballylee, a focal point for many poems in his collection The Tower. As much as I appreciated the maps’ information, I did see some limitations in the design of the website. My main criticism is that it’s not easy to access the page where readers can navigate “Yeats, His World.” In fact, I doubt I would have found the project at all had I not seen it in the physical exhibition in Dublin. 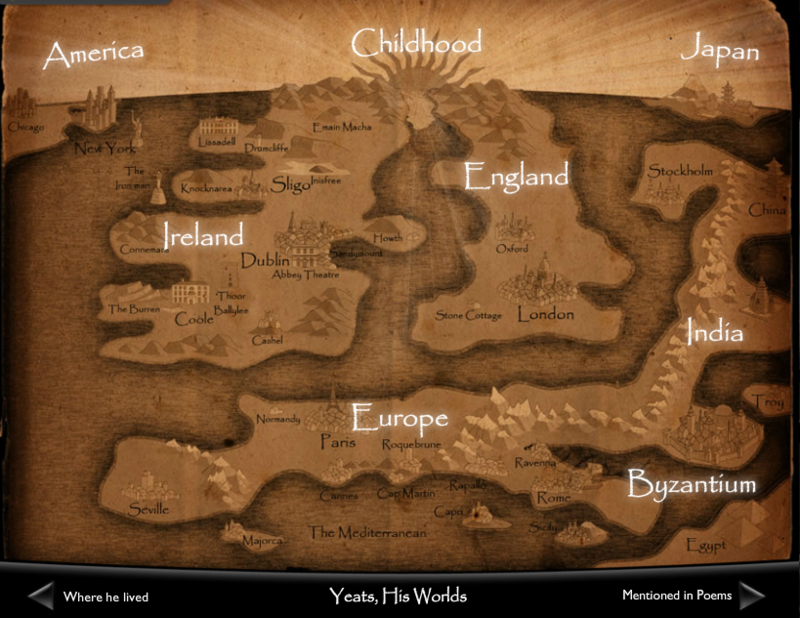 This is because the map is embedded as a child page in the larger digital exhibition on Yeats. Several instances (including twice during my own presentation, regrettably) I couldn’t access the childpage I needed at all, despite going through the same set of steps I had used to get “Yeats, His World” previously. Another issue I had with the map is that the design is crafted to look like an older, vintage map (most noticeably in the yellow coloring and torn edges at the sides) which I found a little corny considering the map actually uses a sophisticated digital interface. These criticisms aside, though, I felt the site was a useful template for my work in mapping out a digital biography to show how a historical figure intersects with different global regions.